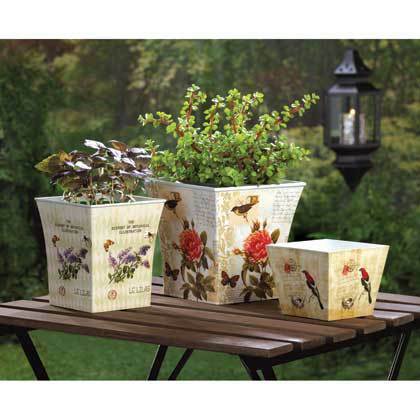 BOTANICAL GARDEN PLANTER TRIO SET by Summerfield Terrace home decor, jewelry, decor, decorations, electronics, fountains, floor mats, art glass, vases, garden essentials, fireplace screens. Large: 7 1/8" x 7 1/8" x 7" high; Medium: 5 5/8" x 5 5/8" x 6" high; Small: 5" x 5" x 4" high. Material(s): PLASTIC CALCIUM CARBONATE. Weight 3 pounds.